Bundesliga | How will Borussia Dortmund line up under Lucien Favre? 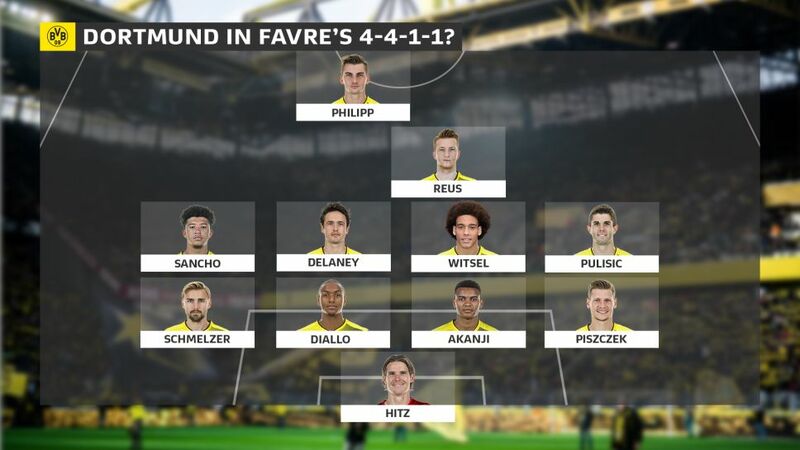 How will Borussia Dortmund line up under Lucien Favre? With Borussia Dortmund embarking on their first season under Swiss tactician Lucien Favre, intrigue abounds as to how he will set his team up. The former Borussia Mönchengladbach boss had some happy times with Marco Reus at the Foals, but what will his appointment mean for the rest of the BVB squad? Favre has carried each of Hertha Berlin, Gladbach and Nice to European finishes over the last decade – teams not necessarily expected to scale such heights – and BVB will be hopeful he has some Yellow and Black magic dust to sprinkle on Die Schwarzgelben. The two campaigns in question each had two distinctly successful spells: In 2016/17 Nice were top of the table between Weeks 6 and 19 before settling into third; last season – following the losses of star performers Wylan Cyprien (to injury), and Younes Belhanda (to Galatasaray) – Nice struggled to find their rhythm until the new year, but then climbed from 18th to eighth. The biggest common denominator, a free-scoring Mario Balotelli aside? A 4-3-3 formation. When Favre experimented with three at the back or a packed midfield, the goals – and points – simply failed to roll in in quite the same way. Further back, Nice signed Adrien Tameze last summer expecting Jean Seri to leave. When the latter stayed, Favre put them both in his midfield. The pair could each anchor the team or get involved in attacks, but it was left predominantly to Pierre Lees-Melou to break into the opposition box with late runs which are strikingly similar to Bayern Munich's recent acquisition from Schalke, Leon Goretzka. Favre could even pair up his right-footers one week, left-footers the next. Maximilian Philipp could lead the line with Reus and Christian Pulisic either side: Pulisic, Dortmund’s top assister with six last season, on the right; Reus, who plundered seven Bundesliga goals from 11 games after returning from injury, on the left. Tired legs on their part could see Marius Wolf and Jadon Sancho playing in tandem instead. Wolf would fancy his chances of building on a team-high nine assists and five goals at Eintracht Frankfurt last season if allowed to cut inside from the wing, adrift of opposition defenders, the way Plea did last term from the opposite flank. The arrival of Witsel is bigger news than it might initially appear. In recent years Dortmund have often struggled in decisive matches at the business end of the season, lacking an intimidating midfield enforcer to complement the more diminutive, twinkle-toed playmakers around him. But no more. With the prospect of Witsel teaming up with Delaney in front of the backline, it is hard to see Dortmund being outmuscled by anyone. Favre’s Gladbach were their own outliers between 2011 and 2015, playing a 4-4-1-1. It worked, though. With a limited budget the Foals finished fourth, eighth, sixth and third in Favre’s four seasons at the club. In the early part of Favre’s reign, Reus – a player he’ll happily inherit at BVB – played off Mike Hanke. After Reus swapped Borussias, Raffael was the player typically tasked with playing behind Max Kruse. Watch: Marco Reus has scored against every Bundesliga club, including Gladbach and Dortmund! This meant Gladbach could quickly pack the midfield if they lost the ball, but when they had possession, Reus – and then Raffael – were nigh on impossible to mark. In the case of the former, his most prolific season to date came in 2011/12, when he scored 21 goals in all competitions. Often used wide or deep since he returned to Dortmund, Reus’ joy might even outstrip Dahoud’s on being restored as a de facto centre-forward. Reus is not the only world star who began to play his best football under Favre either: Marc-Andre ter Stegen went from academy graduate to the apple of Barcelona’s eye under the auspices of the Swiss tactician; Granit Xhaka earned a move to the English Premier League with Arsenal, and even Juan Arango – already a national treasure for Venezuela with European top-flight experience – says himself that he played his best football under Favre. Further forward, it’s win-win: either play a front three, let Pulisic get around the full-back and create chances for Reus, plus Philipp – or whomever else occupies the centre-forward position – and watch opposition nets bulge, or rekindle the Gladbach years, and truly unlock the player Reus has always threatened to become.